Have you wondered what it takes to start and run a pet sitting and dog walking business or how to make your current pet business more profitable? Whether you are considering starting a new pet care business or already have a pet business and you'd like to take it to the next level, 30 Days To Start and Grow Your Pet Sitting and Dog Walking Business will empower you to confidently start or expand your pet sitting and dog walking business in just 30 days. Filled with insights gained over a successful career as a pet sitting and dog walking business owner and pet business coach, Kristin Morrison's newest book follows an easy-to-use sequence of actions you need to take to launch or improve your existing business. 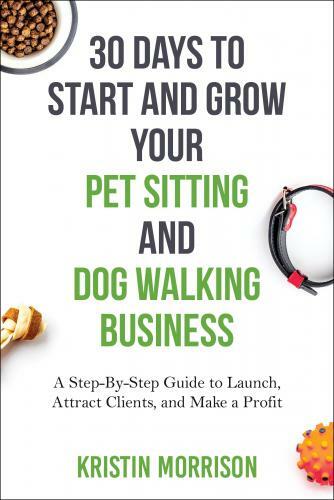 Each chapter includes solutions to start-up or business expansion challenges and compelling examples from Kristin's own business and real-life pet sitting and dog walking professionals, including many of the pet business owners she has helped in her nearly two decades of pet business coaching. After reading this book, you will know what it takes to get started or expand your pet sitting and dog walking business, how to set competitive prices, and what services customers really need. You'll also discover the best way to identify your ideal customer, how to find and keep clients through empowered marketing strategies, and action steps to increase your profits year after year. 30 Days to Start and Grow Your Pet Sitting and Dog Walking Business is the practical and inspiring guide you need to launch or expand your pet business. Kristin Morrison started her pet care company in 1995 and it grew to be one of the largest pet sitting and dog walking companies in California before she sold it eighteen years later. Kristin provides business coaching for thousands of pet sitters, dog walkers, dog trainers, and pet groomers across the United States, Canada, the UK and Australia. In 2008 she founded Six-Figure Pet Sitting Academy™ and Six-Figure Pet Business Academy™ providing coaching, webinars and business products for pet business owners. Kristin enjoys helping pet business owners create success with ease. She is also the creator of the Prosperous Pet Business Online Conference and she hosts the Prosperous Pet Business podcast which can be found on iTunes and on the Prosperous Pet Business website.